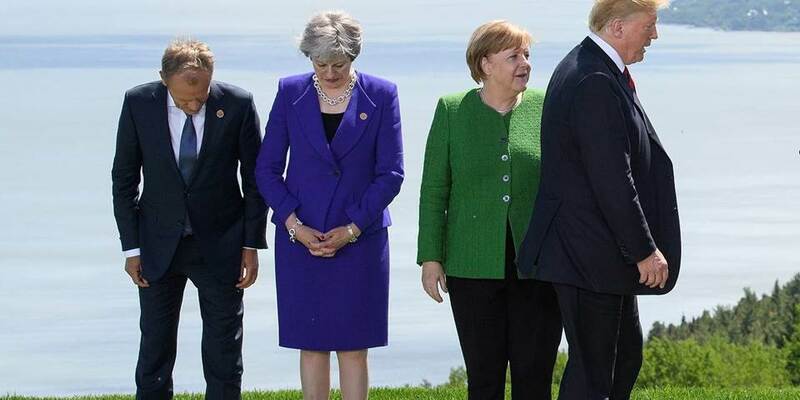 LONDON – Though US President Donald Trump’s appearance at the Group of Seven (G7) summit in Quebec last week was not particularly well received, I find myself sympathizing with his skepticism toward the group. I have long doubted that the annual meeting of leaders from Canada, France, Germany, Italy, Japan, the United Kingdom, and the United States serves any useful purpose. Back in 2001, when I coined the BRIC acronym, I predicted that the growing economic importance of Brazil, Russia, India, and China would eventually require a significant change to global economic governance. At a minimum, I observed, global-governance bodies should include China, if not all of the BRICs. At the same time, I pointed out that there was little reason for France, Germany, and Italy to be represented individually, given that they share a currency, a monetary policy, and a framework for fiscal policy (at least in principle). And I questioned whether Canada and the UK should still be included among the world’s most important economies. It has now been 17 years, and the G7 is still serving little other purpose than to keep its member states’ civil servants busy. Yes, it still comprises the seven Western democracies with the largest economies, but barely so. At this point, Canada’s economy is not much bigger than Australia’s, and Italy’s is only slightly bigger than Spain’s. The G7 is an artifact of a bygone era. In the 1970s, when the G5 was expanded to include Canada and Italy, the new grouping really did dominate the world economy. Japan was booming, and many expected it to catch up to the US; Italy was growing, and nobody was thinking about China. But this year, China is projected to overtake the entire eurozone. And at its current rate of growth, it will effectively create a new economy the size of Italy in less than two years. Moreover, India’s GDP is already larger than Italy’s, and crisis-ridden Brazil is not far behind. In other words, the only global legitimacy that the G7 can claim is that it represents a few major democracies. But 85% of the increase in world GDP (in US dollars) since 2010 has come from the US and China, and nearly 50% from China alone. Another 6% has come from India, while the dollar value of the Japanese and EU economies has actually declined. In light of these realities, the G7 would be much more relevant if Canada, France, Germany, and Italy were replaced by China, India, and a single delegation representing the eurozone. But, of course, there is already a body that represents the current G7 countries as well as the BRICs: the G20, which was formed 1999. Since its first formal summit in 2008, the G20 has served a clear purpose as a forum for the world’s leading economies. For any smaller club to be justified, it must have the same legitimacy as the G20. Representing the democracies that had the largest economies in the 1970s is no longer good enough. After all, India and Brazil also have functioning democracies, and could soon become more prosperous than France and the UK. Trump provoked outrage when he demanded last week that the G7 re-incorporate Russia, which was kicked out following Russian President Vladimir Putin’s 2014 annexation of Crimea. But it is worth asking what global challenges the current G7 is even capable of addressing, outside of narrow economic issues. From terrorism to nuclear proliferation to climate change, there are hardly any issues that can be solved without the help of non-G7 countries. And though the Western media depicted Trump as the black sheep of the summit, Italy, too, now has a government that favors rapprochement with Russia. The recent G7 circus has added to the impression that Western policymakers are incapable of getting a grip on some of the world’s most pressing issues. To be sure, global financial markets showed little concern about the disarray in Quebec last weekend. But, among other things, that may simply reflect the fact that the G7 no longer matters. Looking ahead, it is clear that the G20 offers a better global-governance forum than does the G7 in its current state. Although a greater number of participants makes it harder to reach a viable consensus, it is also much more representative. Most important, the G20 includes the countries that will be indispensable for solving global problems now and in the future. That said, a smaller, representative group of countries could still have a future role to play alongside the G20. But only if it is properly conceived. To that end, the world’s leading think tanks should start offering specific ideas about the future of global governance. For my part, I will look forward to leading the charge when I assume the chairmanship of Chatham House next month. Jim O'Neill, a former chairman of Goldman Sachs Asset Management and former Commercial Secretary to the UK Treasury, is Honorary Professor of Economics at Manchester University and former Chairman of the Review on Antimicrobial Resistance.